Bank of America and U.S. Bank have launched real-time P2P transactions via the clearXchange network operated by Early Warning, a bank-owned risk management service. The deal means the banks’ combined 22 million U.S. customers can send payments to each other, according to Early Warning. The process works like this: A customer enrolls in one of the bank’s money transfer programs, after which he can make a P2P payment either online or through a mobile device using a recipient’s email address or mobile number. The person on the other end receives a payment notification and can withdraw the funds at a bank branch, ATM, via a debit card at a point of sale or other methods. Consumers’ account information is not shared. Banks pay for this service based on a cost structure determined by volume, Early Warning says, declining to share more details. Early Warning’s clearXchange network includes other major banks such as Capital One, Chase, FirstBank, First Tech Federal Credit Union and Wells Fargo, plus several other members and a regional community bank on the verge of joining, the spokesperson says. “Bank of America and U.S. Bank were the first to go live with real-time payments, and we anticipate other members to go live with the capability over the next few quarters,” the spokesperson says. 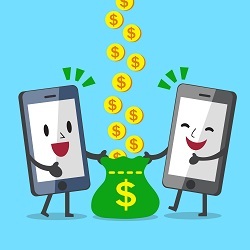 The push for real-time P2P payments has been gaining momentum from banks, regulators and technology providers, but the jury is still out on whether anyone can make money on the service. That said, consumers may come to expect it from their financial services provider or look to disruptors to conduct the transactions. P2P Lending Gains Ground in U.K.